The UMKC School of Medicine’s Orthopaedic Surgery residency program has used a VirtaMed ArthroS™ for a little over a year. During that time, they have learned that the residents love the simulator and that the initial investment pays off. Program Director Dr. James Bogener explains why the ArthroS™ was chosen and how it has been utilized in training. He even gives tips for program directors on the fence about virtual reality simulation. Every time a resident uses the simulator the program saves 200-300 dollars. When Dr. Bogener was tasked to create a surgical skills laboratory for one of Missouri's oldest orthopedic residency programs, the initial plan was to work with low-fidelity simulation on an economy budget. But when the Hall Family Foundation offered extra funding for the program, Dr. Bogener knew what he wanted: a good arthroscopic simulator. The program faculty evaluated all available arthroscopic simulators, and Dr. Bogener personally tested each one of them. “The VirtaMed ArthroS™ was simply unmatched by anything else on the market”, Dr. Bogener summarizes the experience. “The ArthroS™ was as close to the actual operating room experience as possible.” Not only were the virtual reality graphics the most realistic, but the haptic feedback was also the most lifelike due to the fact that the ArthroS™ features actual physical structures instead of robotics. This means the trainees will not be able to force their way through bones any more than they could in real life. The UMKC Orthopaedic Surgery program have had the VirtaMed ArthroS™ with FAST, Knee, and Shoulder Modules for over a year, and they are looking forward to adding the newly released Hip Module to the mix. 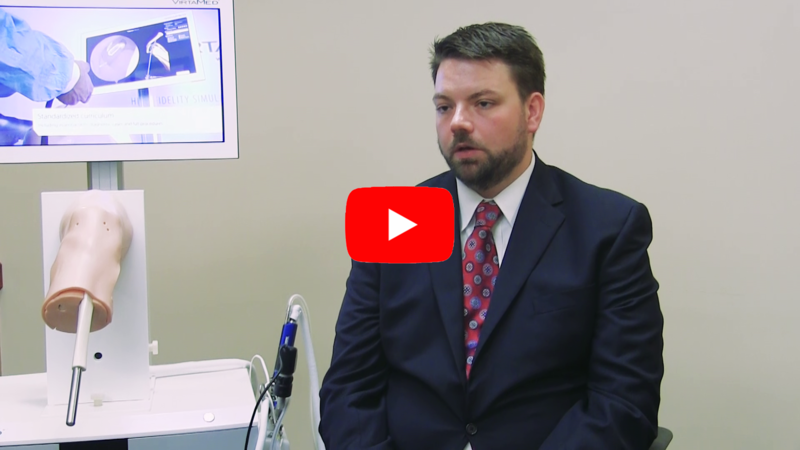 At first, Dr. Bogener was not sure how enthusiastic the residents would be about the new device, so he tested it out by simply placing it in a room and giving all residents access to it at all times. He soon found out that residents loved the ArthroS™: every one of them created their own user account on the simulator and started practicing on it without the director telling them to. Now the program uses one anatomical module for four months at a time, and the junior residents are expected to go through the module's entire proficiency-based curriculum in that period. Senior residents use the simulator at their leisure: many like to practice on it before a difficult case, while others want to refresh their skills before their first orthopedic rotation. The simulator is in heavy use every day by residents ranging from first to fifth post graduate year. Although the ArthroS™ is a tool for the residency program, Dr. Bogener has also used it in a medical students' orthopedic surgery interest group. The students were just as infatuated as the residents, and they have requested more of the same. The simulator sparks an interest in orthopedic surgery as it lets medical students feel like surgeons, even if only for a few minutes, Dr. Bogener explains. In Dr. Bogener's experience, the simulator prepares the residents for real life procedures in several ways: it helps them with triangulation, and it teaches them how hard they can push without causing damage. Furthermore, the simulator gives them confidence in their own abilities. Confidence does not mean hubris, Dr. Bogener clarifies. Rather the opposite: using the arthroscope might look very simple to a bystander, while first-hand experience can create a new appreciation for the skills that can only be acquired through hard work. In his role as the program director, Dr. Bogener sees the objective feedback reports as one of the best features of the VirtaMed simulator. The reports give him a grasp of the residents' baseline skills, and they allow him to monitor each individual's learning curve as well as the entire group's progress. Residents will also benefit from analyzing their procedures in detail together with the teacher, while the objectivity of the automatic reports helps keep the teaching staff's bias in check. Dr. Bogener has two tips for other program directors considering simulation training. First, make sure to provide all residents access to the simulator 24/7. UMKC keeps the simulator in a locked room fitted with security cameras and badge access, and residents drop by at their leisure. Even with packed schedules, this flexibility allows them to find the time to practice during short breaks, late evenings, or quiet periods while on call. The second advice is to take advantage of the modularity of the VirtaMed system. Dr. Bogener recommends to join forces with departments like OB/GYN and urology to purchase a base to share; each department will then only need to buy individual modules for the simulator base. That way the simulator gets to be used more frequently and across disciplines. After the initial investment, the VirtaMed ArthroS™ saves a great deal of money. When an ArthroS™ case is finished, everything is immediately back to normal and there are no disposable parts to replace. To get the same amount of practice as with the simulator, each resident would have to plough through several cadavers or low-fidelity models. “Every time one of our residents uses the ArthroS™ the program saves 200–300 dollars”, Dr. Bogener estimates.